Vietnamese carrot - Agrideco Vietnam Co., Ltd.
Vietnamese carrot is mostly cultivated Hai Duong province and Bac Ninh province. 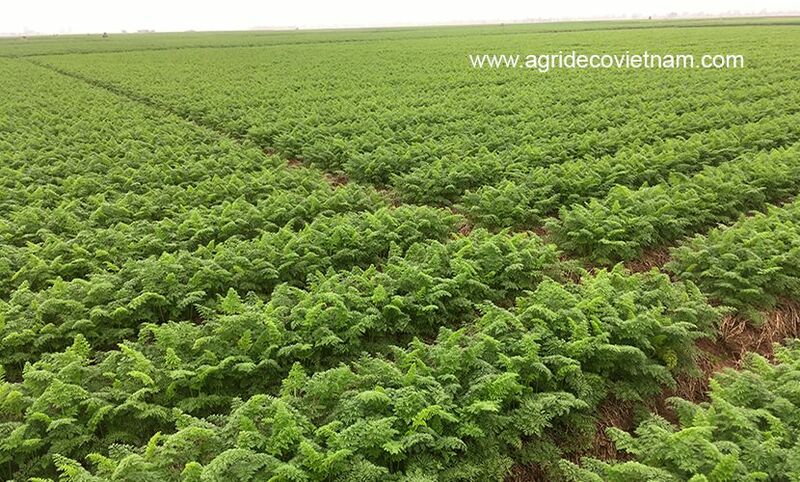 Total area of carrot cultivation in two provinces is more than 4,000 ha with an annual quantity of 150,000 MTs. Agrideco Vietnam Co., Ltd. has earned an outstanding reputation for high quality carrot from Vietnam to global markets. Moreover, our prices are also very competitive. In fact, the guaranteed period is available from February to June each year. They are shipped in refrigerated sea containers to more than 10 countries. In 2016, we exported more than 200 MTs of carrot from Vietnam. Quality of Vietnamese carrot is the greatest pride for us. Our carrots are produced without using synthetic chemicals, pesticides or herbicides. In addition, we closely monitor and register the quality of fresh harvested carrots and the process of washing, packing and delivery. Therefore, we commit the high standards of food safety to customers. In common, big sizes of fresh carrot (L, 2L and 3L) is popular for customers in Korea, Japan and Thailand. Conversely, customers in Malaysia and Middle East prefer carrot with smaller sizes (S and M). Vietnam carrot: M size (150g-200g)For this reason, we are looking forward to introducing a delicious vegetable from Vietnam to global customers. Our business philosophy is to commit win – win cooperation among parties. Furthermore, we are doing the best to make the world better and better. In summary, we would like to be your reliable partner to bring Vietnamese high quality vegetable to the world. In addition, if customers need samples, we will send them to customers. The samples are free but freight, customs fees, and other fees are customers’ responsibility.